does it again with their out of the ordinary marketing, like their subservient chicken, or the the famous dane cook burger king skit. This time, instead of a burger king mask, or a burger costume, they decided to focus on sacrificing your facebook friends. That's right, if you delete 10 of your friends from your facebook, burger king will give you a coupon worth a free whopper! So far, almost 200,ooo people have been sacrificed in order to get this burger king deal. 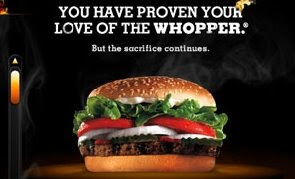 Check it out for yourself and visit http://www.whoppersacrifice.com/ , and finally have an excuse to get rid of some of those friends that you dont care for!